Work Without Limits is always proud to highlight the wonderful work being done by the inclusive employer sponsors in our Disability:IN Massachusetts network. This month, we are featuring the great effort initiated by MAPFRE USA’s Being MAPFRE Committee. To raise disability awareness and foster a culture of inclusion within the company, the Being MAPFRE Committee began as a dedicated way to increase disability inclusion and is now the Diversity & Inclusion Council. In 2018, the company launched ‘Bring Your Whole Self to Work’, an interactive online forum for employees to be able to express their individuality. 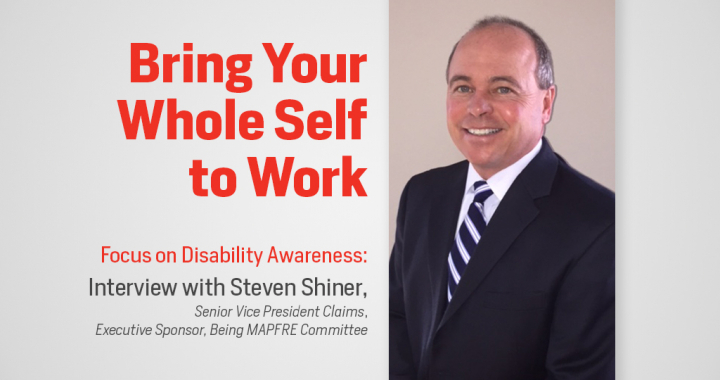 As part of ‘Bring Your Whole Self to Work’, the Being MAPFRE Executive Sponsors, Francois Facon, Executive Vice President and CFO and Steven Shiner, Senior Vice President, Claims, wrote articles focused on Disability Awareness. Below you will read the interview with Steven Shiner and the important emphasis MAPFRE USA puts on being a diverse and inclusive employer. In the spirit of MAPFRE’s Disability & Inclusion 2018 theme of Bring Your Whole Self to Work, can you share a little about yourself? What are some fun facts or interesting information about you that you’d like to share with employees? I’ve been bringing my whole self to work at MAPFRE for a very long time! I started my career with Commerce Insurance in 1985 shortly after graduating from Nichols College. This past January marks my 33rd year with the company. I started out as a Claim representative working in what was a very small department at that time. We had fewer than 30 employees in the Claim department and I was assigned to handle all claims from policyholders whose last name started with a “K”. Yes, believe it or not, that’s how we distributed claims in those days. We also had one computer at the end of each isle shared by 8 – 10 employees. I can’t remember what we used the computer for but obviously, it wasn’t very much! We’ve come a long way since then and I’ve been incredibly fortunate to have been part of the continued growth and success of this company. But the best part of working here for so many years is the hundreds of great people that I’ve gotten to know and the many friendships that I’ve developed. Outside of work I have a lot of interests. I enjoy skiing, cycling, gardening, spending time at the Cape and traveling, but my passion has always been golf. It’s one of life’s most humbling activities but it keeps me out of trouble on weekends. My wife and I have been blessed with three children; two boys and a girl. Two of the three are out on their own pursuing their careers and our third is a sophomore in college. Our eldest, a daughter, just recently gave us the best gift ever, a beautiful granddaughter. So now I have a new passion! Why did you choose to be an Executive Sponsor of the Being MAPFRE Committee? Why is being a part of this work important to you? It was actually one of my colleagues, Mary Singas, who approached me about our diversity and inclusion initiative at MAPFRE. Mary was involved in the program and mentioned the group was looking for an executive sponsor and wondered whether I’d be interested. I loved the idea of becoming part of a team focused on making our work environment more welcoming and inclusive, as well as easier for people with physical disabilities to navigate. But most compelling was the possibility of helping people with disabilities (people who may have had difficulty finding employment elsewhere) build a successful career at MAPFRE. What does workplace inclusion mean to you, whether it’s about disability inclusion or other types of diversity? I envision a working environment where our dedicated, hard-working, employees can be completely comfortable being who they are at work; where diversity is recognized as an organizational strength and where we, as employees, continuously work at focusing on the positive attributes of our fellow employees and celebrating their strengths, rather than perceived differences or limitations. To our employees who identify as having a disability, what would you like them to know? Through my participation in this group, I have come to learn that we have many employees with various types of disability. I know it’s a very personal decision, but for those who identify as having a disability, I’d want those employees to know that we are here to offer our support, any time they need it. Why do you think groups like the new Caregiver’s Network are important to have? What value do you see in affinity groups? I think it’s great that we are helping our employees that have common interests or challenges (such as caring for a loved one with an illness or a disability) develop a network and provide a forum where they can share experiences, ideas and suggestions. There is probably no better support system than to hear about the experiences of others who have walked in your shoes. We’ve accomplished a lot of work in the last few years in respect to disability inclusion. What do you see as important to focus on now and in the future? As I mentioned earlier, I’d like MAPFRE to be recognized as a company that provides employment opportunities to talented people with disabilities. In order to do this, we will have to leverage technology to make accommodations for people with physical disabilities, such as sight or hearing impairments. It will surely take time for us to identify and adapt these technologies to our systems but as we go through our digital transformation I’d like to see us avail ourselves of these opportunities. Mr. Shiner has served as MAPFRE USA’s chief claim officer since March 2014. He is a member of the MAFPRE USA Technical and IT Steering Committees. He has served on various advisory boards and industry committees, including the Governing Board of the Insurance Fraud Bureau of Massachusetts. Mr. Shiner began his career in 1985 with Commerce Insurance, now MAPFRE Insurance. He has held various roles of increasing responsibility within the Claims Department, including manager, Casualty Claims, general manager/assistant vice president, National Claims and vice president, National Claims. Mr. Shiner is a graduate of Nichols College, where he earned a Bachelor of Science in Business Administration. He earned the Chartered Property Casualty Underwriters designation in 2000, and completed the MAPFRE International Management Development program in Madrid, Spain, in 2010 and MAPFRE’s Accelerated Leadership Program in 2012.